Not so often to ask questions, but currently I have no ideas. After a long downtime I decided to reinstall Gentoo on my work puter rather then updating it and fight all this pesky dependencies and blocks. After I got into KDE I finally realized, that it completely screwed up the dualhead setup. Well, it kind of work and both my monitors work fine, except there is no way to make KDE understand it is two separate devices and "stick" windows to monitor borders. So, when I press Alt-F2, the prompt emerges on the center of a virtual display divided by physical monitors on two parts. Same for windows maximization: if I press max. button the window maximizes on the whole screen 0 with one half on left monitor and another on the right. That drives me out of mind completely. Anybody know how to fix that? [ 6392.385] (==) Using system config directory "/usr/share/X11/xorg.conf.d"
[ 6392.385] (==) No Layout section. Using the first Screen section. [ 6392.385] (==) No screen section available. Using defaults. [ 6392.385] (**) | |-->Monitor "<default monitor>"
[ 6392.385] (==) No monitor specified for screen "Default Screen Section". [ 6392.385] (WW) The directory "/usr/share/fonts/misc/" does not exist. [ 6392.385] Entry deleted from font path. [ 6392.385] (WW) The directory "/usr/share/fonts/TTF/" does not exist. [ 6392.385] (WW) The directory "/usr/share/fonts/OTF/" does not exist. [ 6392.385] (WW) The directory "/usr/share/fonts/Type1/" does not exist. [ 6392.385] (WW) The directory "/usr/share/fonts/100dpi/" does not exist. [ 6392.385] (WW) The directory "/usr/share/fonts/75dpi/" does not exist. [ 6392.385] (==) ModulePath set to "/usr/lib64/xorg/modules"
[ 6392.385] (II) The server relies on udev to provide the list of input devices. [ 6392.387] (II) LoadModule: "glx"
[ 6392.401] (II) Module glx: vendor="NVIDIA Corporation"
[ 6392.402] (II) LoadModule: "nvidia"
[ 6392.402] (II) Module nvidia: vendor="NVIDIA Corporation"
[ 6392.402] (II) LoadModule: "nouveau"
[ 6392.402] (II) UnloadModule: "nouveau"
[ 6392.402] (II) LoadModule: "nv"
[ 6392.403] (II) UnloadModule: "nv"
[ 6392.403] (II) LoadModule: "modesetting"
[ 6392.403] (II) UnloadModule: "modesetting"
[ 6392.403] (II) LoadModule: "fbdev"
[ 6392.403] (II) UnloadModule: "fbdev"
[ 6392.403] (II) LoadModule: "vesa"
[ 6392.403] (II) UnloadModule: "vesa"
[ 6392.405] (II) Loading sub module "fb"
[ 6392.405] (II) LoadModule: "fb"
[ 6392.406] (II) Module fb: vendor="X.Org Foundation"
[ 6392.406] (II) Loading sub module "wfb"
[ 6392.406] (II) LoadModule: "wfb"
[ 6392.406] (II) Module wfb: vendor="X.Org Foundation"
[ 6392.406] (II) Loading sub module "ramdac"
[ 6392.406] (II) LoadModule: "ramdac"
[ 6392.725] (WW) NVIDIA(GPU-0): check for mode "1280x720". [ 6392.725] (WW) NVIDIA(GPU-0): check for mode "720x576". [ 6392.727] (WW) NVIDIA(GPU-0): check for mode "1280x720". [ 6392.727] (WW) NVIDIA(GPU-0): check for mode "720x576". [ 6392.728] (==) NVIDIA(0): No modes were requested; the default mode "nvidia-auto-select"
[ 6392.728] (==) NVIDIA(0): will be used as the requested mode. [ 6392.728] (II) NVIDIA(0): "DFP-0:nvidia-auto-select,DFP-1:nvidia-auto-select"
[ 6392.750] (II) NVIDIA: access. [ 6392.752] (II) NVIDIA(0): Config Options in the README. [ 6392.779] (II) NVIDIA(0): Setting mode "DFP-0:nvidia-auto-select,DFP-1:nvidia-auto-select"
[ 6392.969] (II) Loading sub module "dri2"
[ 6392.969] (II) LoadModule: "dri2"
[ 6393.000] (**) Power Button: Applying InputClass "evdev keyboard catchall"
[ 6393.000] (II) LoadModule: "evdev"
[ 6393.000] (II) Module evdev: vendor="X.Org Foundation"
[ 6393.000] (**) evdev: Power Button: Device: "/dev/input/event1"
[ 6393.000] (**) Option "config_info" "udev:/sys/devices/LNXSYSTM:00/LNXPWRBN:00/input/input1/event1"
[ 6393.000] (**) Option "xkb_rules" "evdev"
[ 6393.000] (**) Option "xkb_model" "pc104"
[ 6393.000] (**) Option "xkb_layout" "us"
[ 6393.018] (**) Power Button: Applying InputClass "evdev keyboard catchall"
[ 6393.018] (**) evdev: Power Button: Device: "/dev/input/event0"
[ 6393.018] (**) Option "config_info" "udev:/sys/devices/LNXSYSTM:00/LNXSYBUS:00/PNP0C0C:00/input/input0/event0"
[ 6393.018] (**) Option "xkb_rules" "evdev"
[ 6393.018] (**) Option "xkb_model" "pc104"
[ 6393.018] (**) Option "xkb_layout" "us"
[ 6393.019] (II) No input driver specified, ignoring this device. [ 6393.019] (II) This device may have been added with another device file. [ 6393.020] (II) No input driver specified, ignoring this device. [ 6393.020] (II) This device may have been added with another device file. [ 6393.020] (**) Logitech Logitech BT Mini-Receiver: Applying InputClass "evdev keyboard catchall"
[ 6393.020] (**) evdev: Logitech Logitech BT Mini-Receiver: Device: "/dev/input/event3"
[ 6393.020] (**) Option "config_info" "udev:/sys/devices/pci0000:00/0000:00:1d.2/usb8/8-2/8-2.2/8-2.2:1.0/0003:046D:C71B.0001/input/input6/event3"
[ 6393.020] (**) Option "xkb_rules" "evdev"
[ 6393.020] (**) Option "xkb_model" "pc104"
[ 6393.020] (**) Option "xkb_layout" "us"
[ 6393.021] (**) Logitech Logitech BT Mini-Receiver: Applying InputClass "evdev pointer catchall"
[ 6393.021] (**) Logitech Logitech BT Mini-Receiver: Applying InputClass "evdev keyboard catchall"
[ 6393.021] (**) evdev: Logitech Logitech BT Mini-Receiver: Device: "/dev/input/event4"
[ 6393.021] (II) evdev: Logitech Logitech BT Mini-Receiver: Forcing absolute x/y axes to exist. [ 6393.021] (**) Option "config_info" "udev:/sys/devices/pci0000:00/0000:00:1d.2/usb8/8-2/8-2.3/8-2.3:1.0/0003:046D:C71C.0002/input/input7/event4"
[ 6393.021] (**) Option "xkb_rules" "evdev"
[ 6393.021] (**) Option "xkb_model" "pc104"
[ 6393.021] (**) Option "xkb_layout" "us"
[ 6393.021] (II) evdev: Logitech Logitech BT Mini-Receiver: initialized for relative axes. [ 6393.021] (WW) evdev: Logitech Logitech BT Mini-Receiver: ignoring absolute axes. [ 6393.021] (II) No input driver specified, ignoring this device. [ 6393.021] (II) This device may have been added with another device file. [ 6393.468] (WW) NVIDIA(GPU-0): check for mode "1280x720". [ 6393.469] (WW) NVIDIA(GPU-0): check for mode "720x576". [ 6393.482] (WW) NVIDIA(GPU-0): check for mode "1280x720". [ 6393.482] (WW) NVIDIA(GPU-0): check for mode "720x576". [ 7070.318] (WW) NVIDIA(GPU-0): check for mode "1280x720". [ 7070.318] (WW) NVIDIA(GPU-0): check for mode "720x576". [ 7070.332] (WW) NVIDIA(GPU-0): check for mode "1280x720". [ 7070.333] (WW) NVIDIA(GPU-0): check for mode "720x576". 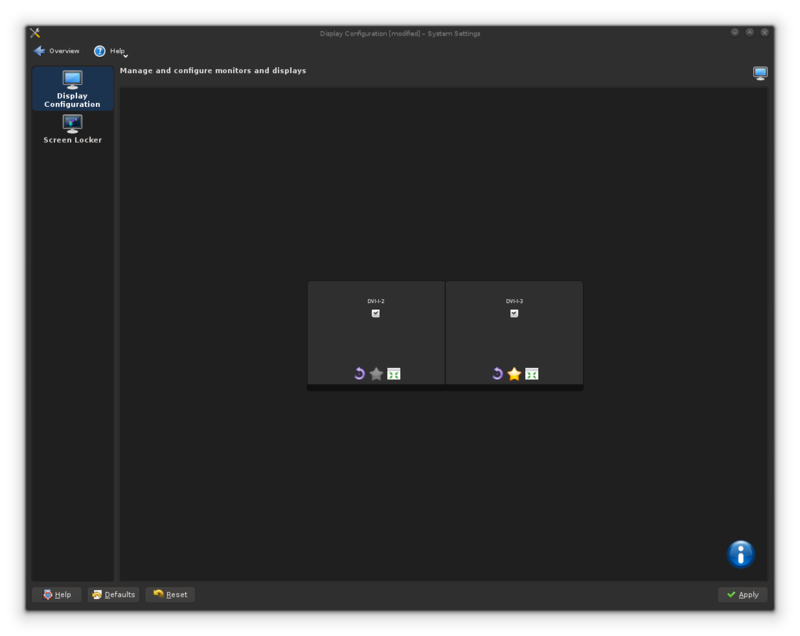 1) Load up System Settings in KDE, and then go to "Display and Monitor" and finally "Display Configuration"
What do you see? Can you take a screenshot and upload an image somewhere? 2) Can you post your settings in /etc/X11/xorg.conf.d/40-monitor.conf? I have no /etc/X11/xorg.conf.d/ at all, it's new plane setup. I made an attempt to use my old working config (from this particular machine) with nVidia TwinView and all the rest with no luck. You're missing the option to change screen resolution, so something's wrong right there, don't know if it's related or not. I've actually got the same thing on one of my laptops which I haven't tried to fix yet. will post back when I have. AFAIK, KDE folks rolled out some new kwin manager that is suppose to handle "what we need", but it does not. Well, at least I'm missing the point or some part of KDE isn't installed by gentoo as it should. In older KDE there were another tab to change all the screen related stuff (with all this greenish rectangles, I still remember that). But I have two fresh installs of KDE on my laptop and work station and both a missing that tab. Googling gave nothing. I feel dumb and that drives me mad since I can't use maximize button anymore, and windows apiaries pretty randomly regardless real screen borders.. Besides, I use virtualbox for all my windows related things and this requires using it in maximized mode, but it now got spitted by halves with one part on left physical screen and another on the right. That simply no way to use it. If dialog boxes and windows are placed across Monitor borders, this usually means that USE="xinerama" was left disabled. Enable it and rebuild the affected packages. I had xinerama disabled on my previous configuration, so I was very surprised that enabling it actually helped. Well, at least all windows new respect physical borders, what is desired. But still no this special tab for screen size configuration in KDE settings.